Thats enough introduction - on with the plants! To navigate this site, use the links above, or the detailed links at the bottom of this page. ... out in the garden. A wondeful mellow sunny afternoon, of the sort that can only happen if the forecast has been for torrential rain. I have been transfixed in the sunlight all day like a fly trapped in amber. Thunder and lightening at night set off my neighbours chickens. There is nothing like the sound of frightened chickens in the dark to underline the cosy perfection of life. I have played with my gingers, eaten chocolate cake and had a long bath. All I need to do now is have a fight with a rent boy about persimmons and it will have been perfect! 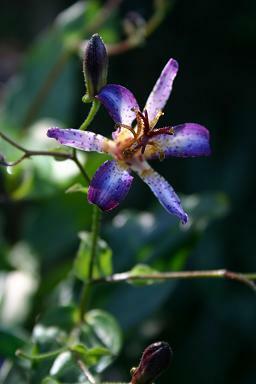 A tiny little Toad Lily with dark purple foliage sheltering large lemon flowers. 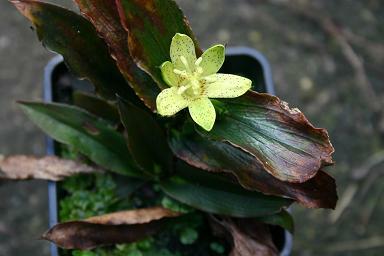 I got it from Andrew Lovell at Ad Hoc Plants, and it has opened this morning. It is a wonderful little thing from Japan. Tricyrtis 'Taipei Silk' (Blue) . I have just bought this, and I love the rich blue purple flowers. Grown by Blooms Wholesale, there were three distinctly different plants growing under the same name, which is unfortunate. Naturally, I had to have them all. This one is (Blue), there is another (Pink) and the last one had some extra segments in the narrow petalled blue flower (Double). I have no ideas which of them is properly 'Taipei Silk' - I suspect it is (Pink) from the picture on the label. It is a brand new introduction and already the name is confused. No wonder there are problems with the naming of Toad Lilies! 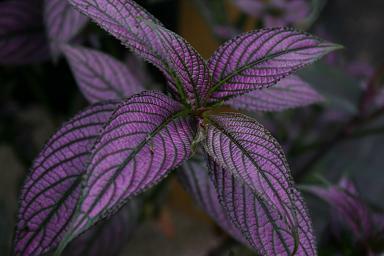 Strobilanthes dyerianus 'Persian Shield' . I can't resist showing a picture of this marvellous leaved plant. Grown as a bedding plant, and not hardy, I may not have it by next year. I am going to try it in the conservatory, but it is a real heat lover. A strange plant that you don't see very often - I last grew it when I was 15! The colour is just too fabulous for words. I can't resist the chance to show off 'Tai Sunlight'. It grew long and leggy last year in the conservatory, but this year it has prospered in the greenhouse and produced two flower spikes. I have a couple of other hybrids from Doyle Smittle coming into flower this year, so the new greenhouse is a success (even if it is a foot too short). 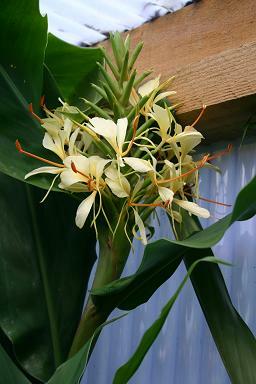 To find particular groups of plants I grow, click on the genus name in the table above. Click on the "Index" box at the top of the page for the full list. I have a lot of good intentions when it comes to updating this site, and I try to keep a note about what is going on, if you are interested. When typing the address in, please replace MONKEY with the more traditional @ symbol! I apologise for the tiresome performance involved, but I am getting too much spam from automated systems as a result of having an address on the front page.